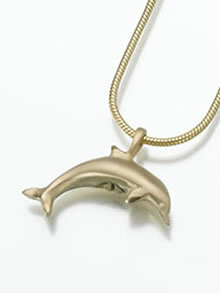 If you love dolphins and the happy spirit they represent, the Silver Dolphin Keepsake Pendant Urn is for you! It is available in Sterling Silver with a highly polished finish. The pendant measures approximately 1/2" tall x 1" long. A tiny amount of cremains, dried flowers, sacred ground, perfume, etc. can be placed inside the dolphin by removing a tiny screw on the bottom of the pendant. By gluing the screw back in place, your precious objects will be safe and secure. A cut 24" black satin cord is provided or you may purchase a Sterling Silver snake chain (shown) or Sterling Silver box chain. Filling and care instructions, a small funnel, and a gift box are included.